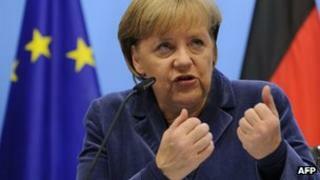 Image caption Will Germany agree to underwrite the debts of the eurozone, as David Cameron hopes? The eurozone has done a deal or has it? The rabbit the leaders pulled out of their hat was a deal with the banks for a 50% haircut on Greek debt. The details though will not be settled until the end of the year. "The leverage could be up to one trillion [euros] under certain assumptions about market conditions and investors' responsiveness in view of economic policies." Mmmm. I can't help feeling that this deal is not yet the real deal. David Cameron still believes and hopes that Germany will eventually agree to the European Central Bank underwriting the debts of the eurozone. It will now be up to the markets to determine whether and when that proves necessary.